Simon Beaufoy’s award winning play returns for it’s final tour after a number of successful years performing to delighted audiences around the UK. 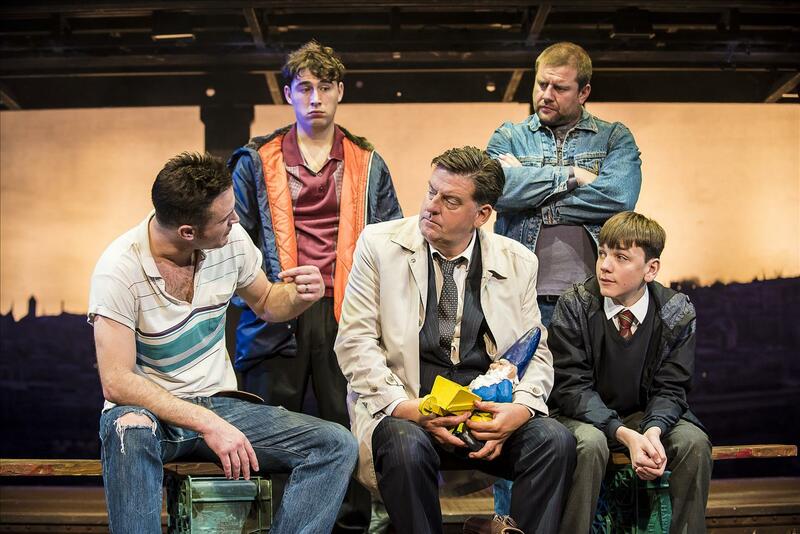 This true to life comedy will entertain and amuse audiences with its ‘tongue in cheek’ humour, as we watch the struggles of six working-class men who have found themselves unemployed and struggling after the renowned Sheffield steal industry faced closures. Wonderfully directed by Rupert Hill, this production offers exactly what people expect, and even a little extra! Designer Robert Jones perfectly designed a set that helped audiences envisage a sense of abandonment, that became a reference for the social contexts and feelings of each character. The warehouse set, captures a glimpse into what was left of the remaining metal industry, with sparks, dangerous iron structures and the smell of smoke fumes filling the air – it really did create a full sensory experience, adding that extra level of authenticity and excitement for the audience . Characters Gaz (Gary Lucy) and Dave (Kai Owen), personify a middle aged troublesome twosome, that are up for a laugh and making ends meat, but are realising the harsh reality of unemployment. With the pressures of unpaid child support, relationship self esteem issues, and the prospects of having to wash pots for a living, the pair find themselves searching for a less conventional way of earning money. When stumbling across a poster for ‘The Chippendales’ the two of them along with Gaz’s reluctant son Nathan, plan to bombard the event – but soon realise that Dave’s wife Jean is there alongside a crowd of excitable screaming women. What is a knock of confidence for an already insecure Dave, becomes ignition of an idea for plotting Gaz – one that leaves little to the imagination! Audiences eagerly anticipate the famous ‘audition scene’ which stayed true to the film and left audience members in hysterics, ending Act One with a particularly memorable moment that you can’t un-see! 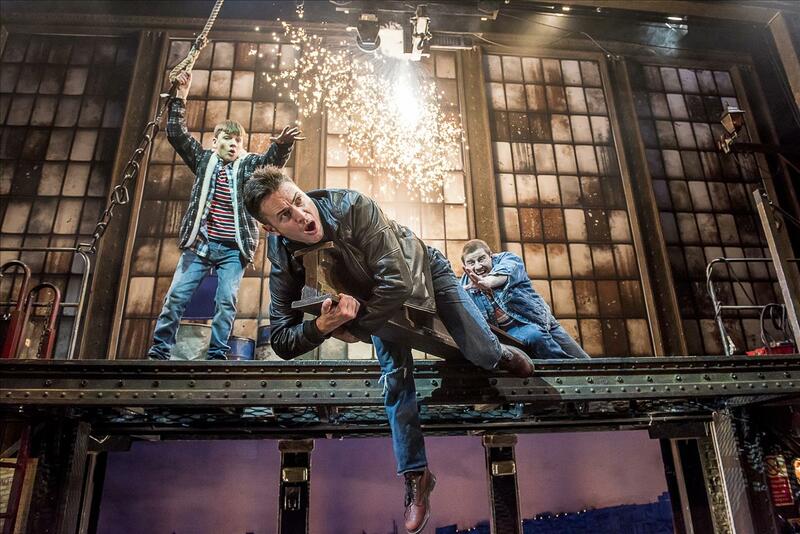 In Act two, we get to know the rest of the newly recruited ‘Full Monty’ gang, as we join them on their journey of attempting to put together a show, a difficult task for the mix-match unlikely accomplices rallied together by the confident, charismatic ring leader Gaz – a performance effortlessly played by Gary Lucy. The cast has quality across the boards including an uptight Gerald played by Andrew Dunn, a young at heart Horse taken on by Louis Emerick, an uneasy Lomper acted by Joe Gill and ladies man Guy, played by actor James Redmond. As a whole, each character added their own dynamic to the fast-paced plot, offering audiences moments of humour, compassion and despair, whilst highlighting the politics of the time and themes of the impotence of unemployment. Likeable, relatable Dave is played by Kai Owen, who provides the laughs and won the audience over with his one liners about his insecurities. Overall the chemistry and comic timing between the cast was delightful to watch, while the female members also added a alternative portrayal of the challenges of sticking by their men in a time of turmoil. The anticipated ending finally arrived and we got the chance to see the guys do their thing! The audience really did feel like they were watching the characters debut ‘Full Monty’ performance and were full of excitement as they showed support and loudly cheered as they unveiled their routine. ‘The Full Monty’ takes you on a journey of true determination whilst in the face of adversity, and provides (literally) unmissable full frontal entertainment. 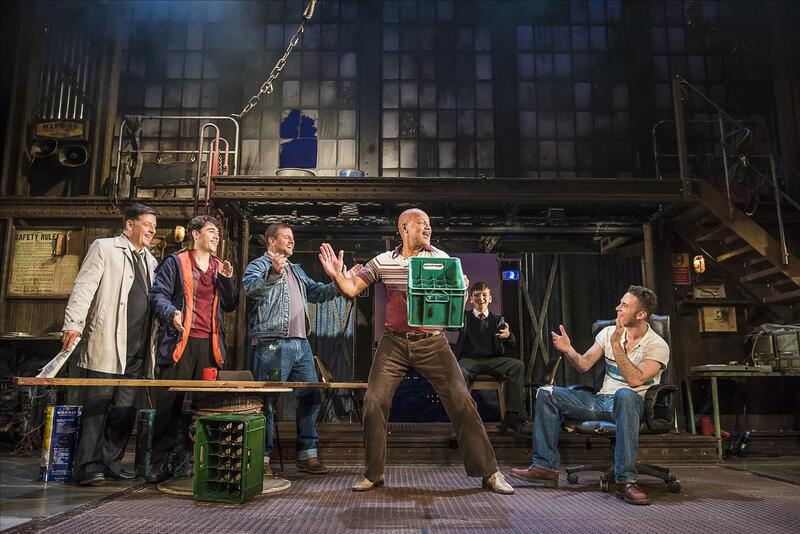 And finally the question that everyone wants to know…Do they really go the ‘Full Monty?’…Well I guess you will have to go and see it for yourself! Laura has a Masters in Performance from Liverpool Hope University.